I am slowly plodding along on my second legwarmer. 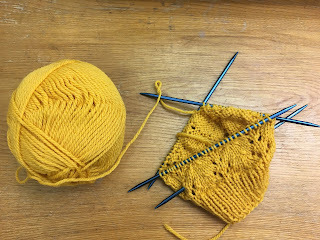 My hope is to have a nice marathon knitting session this weekend and get most of it done, but I have a few other design projects cooking right now, so we'll see how much I'll get to. My second tap dance class was last night, and I'm enjoying being in dance so far. I always wanted dance lessons, but I made do for years with the dancing I had to learn for musicals. It's great to be able to really dig in and learn more, and it's great to not have my tap shoes languishing in my closet, waiting for the next musical with a tap number! I hope you all have a good weekend! I have some exciting non-knitting news that I'll be able to share on Monday, so I'll see you all then! Those legwarmers are going to be so perfect for fall!